Working with award-winning design firm In Situ Studios, Joseph brought the 3400-square-foot home back to its former glory inside and out over the course of two years. A spacious open floor plan on both levels, skylights above the entry and master bath, and new Jeld-win windows make the house feel light and airy. A slatted guard rail on the stairs and the use of frosted glass to create partitions in the master bath and basement bedroom let light flow freely, while low-profile modernist furnishings create a refined, uncluttered living space. Outside, the sloping roof was extended over a carport and deep single-car garage that replaced the sunroom. Exterior flourishes of a floating wrap-around deck, white pavers, AstroTurf patio and bold yellow front door are more reminiscent of Palm Springs than suburbs in the Southeast. “I wanted to bring some of those cool California styles here,” says Joseph. Thanks to his vision and persistence, this Carolina midcentury home now shines once again. 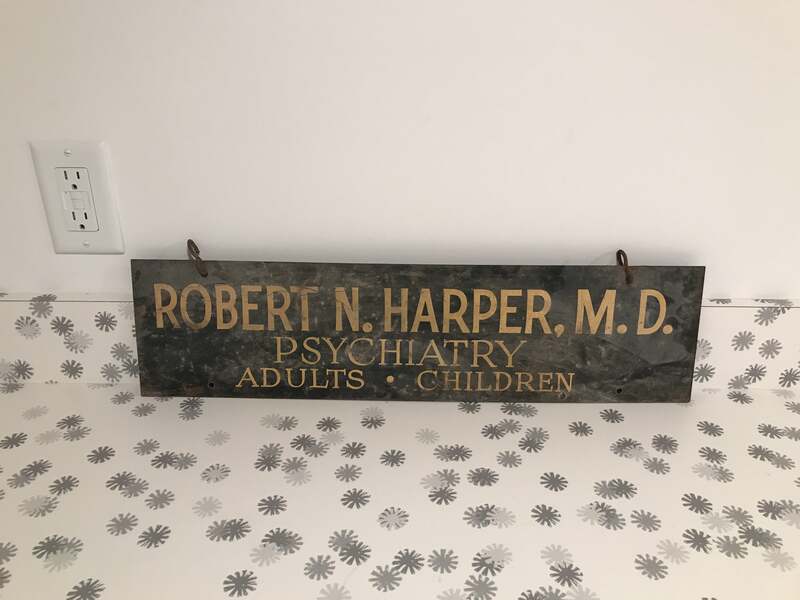 The original homeowner was a psychiatrist named Robert Harper, and this 1960s sign hung at his practice. His wife had cancer and was at Dorothea Dix Hospital in Raleigh. She said she wanted to die in a house, not at a hospital, so Harper had the home built for her and their family. He later remarried, and his widow outlived him and stayed in the home until she passed away a few years ago, when Amory bought it.